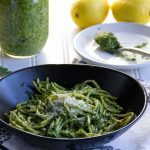 Arugula pesto is an incredibly delicious sauce for pasta: peppery arugula, garlic, sweet buttery pistachios, bright notes of lemon, and rich parmesan. Plus, you can make it in just ten minutes! Arugula makes great pesto. Its bright peppery flavors harmonize beautifully with toasted pistachios, lemon, garlic, and parmesan cheese. It makes a vibrant, delicious sauce for pasta. 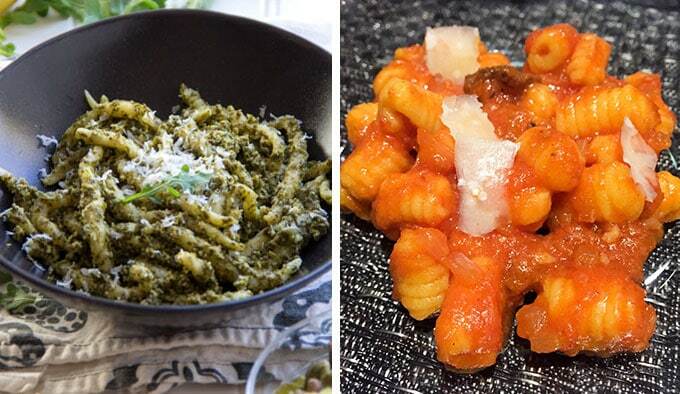 I developed this arugula pesto recipe at the request of my oldest son Alex, for a special pasta dinner that I’ll tell you about, because it was one of the most amazing dinners of my life. 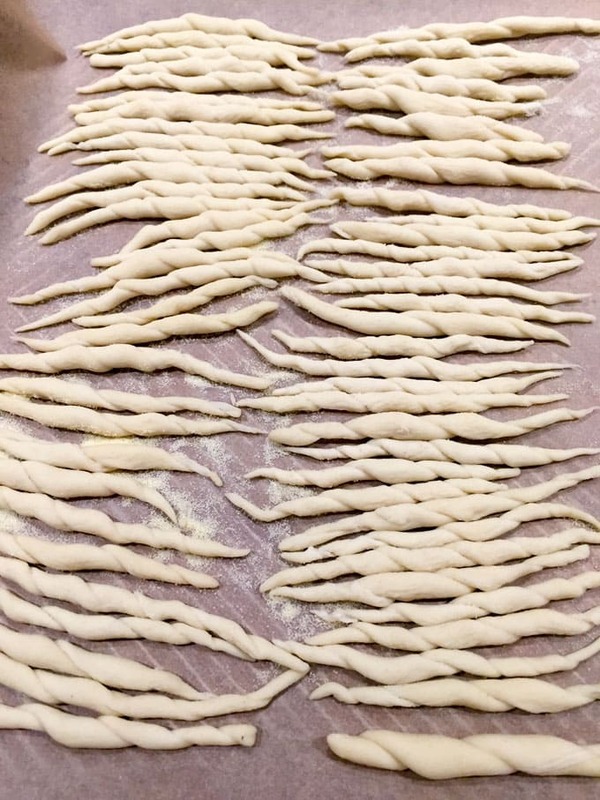 When Alex told me that he was getting into making homemade pasta, I was very psyched on so many levels: I adore pasta, I love when my kids get into cooking and I’m in awe of homemade pasta…. Alex lives in New Orleans. I asked him if he would make pasta for us when he came home for Thanksgiving break. He said yes. 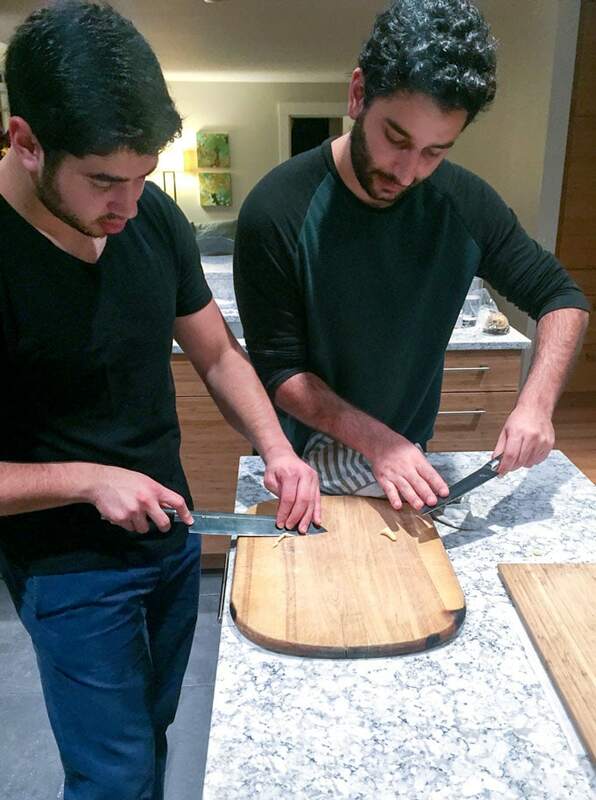 That plan grew into a six course dinner party for 11 people, with 6 homemade pastas and 6 homemade sauces. 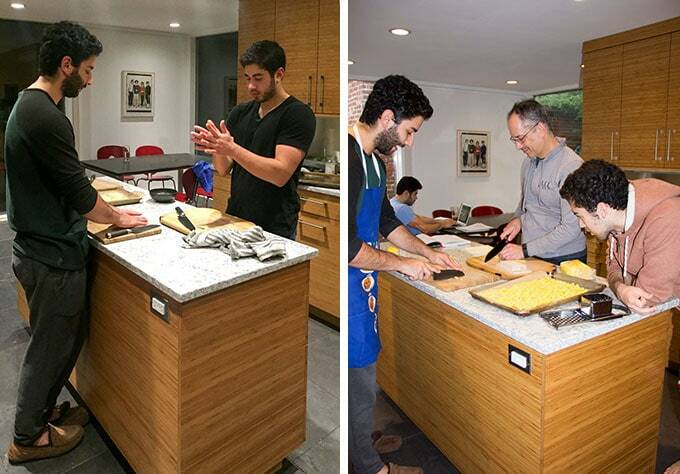 Our whole family was in the kitchen making pasta together for two solid days leading up to the party. 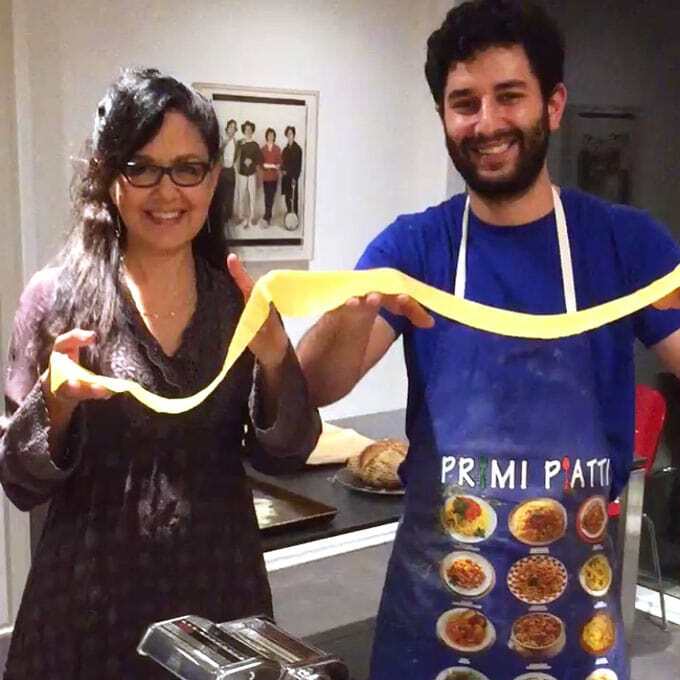 We learned so much about making pasta had we had a total blast! 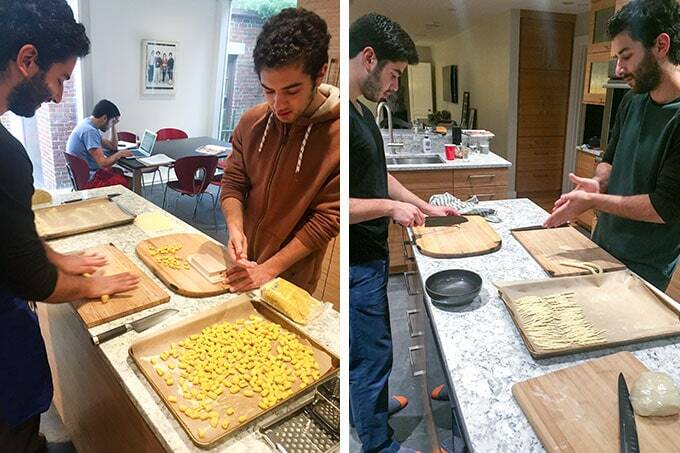 Here’s a photo Alex and me, still making the final pasta – “Caramelle” – about 1/2 hour before our guests arrived on Saturday night. 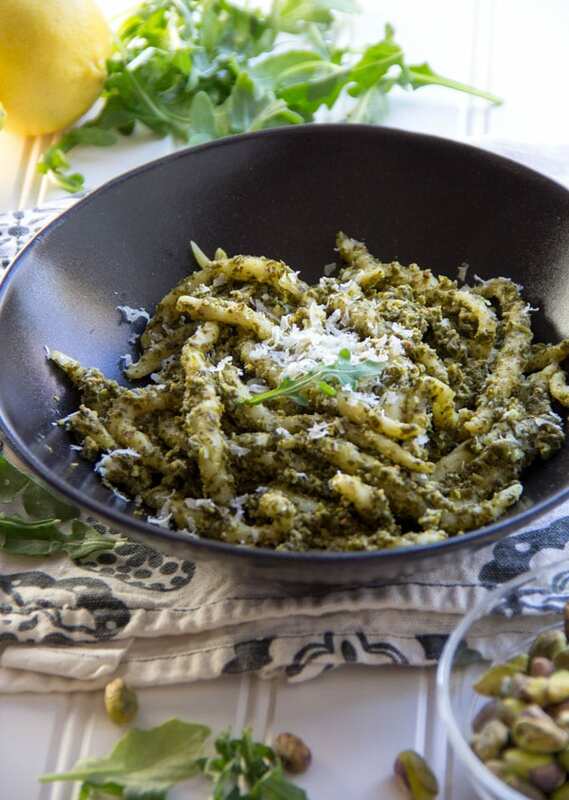 Trofie with arugula pesto was the first pasta course of our dinner and everyone loved it: tender coils of dough tossed with rich vibrant pesto… I’ve since made the arugula pesto twice and served it once over store-bought thin spaghetti and once with capellini. If you don’t have homemade trofie on hand, you will be very happy with either of those options. Trofie takes lots of time and skill to make. Each little piece of pasta is hand rolled and then finessed with a knife, to get the special coils. Check out this cool slo-mo video of Alex shaping a trofie noodle, that I posted on Panning The Globe’s Facebook page. By the time we sat down to the first course, I was so excited to try the trofie and I enjoyed it so much that I forgot to take a picture. Here’s a photo I took the next day with some leftovers. The dinner was spectacular. 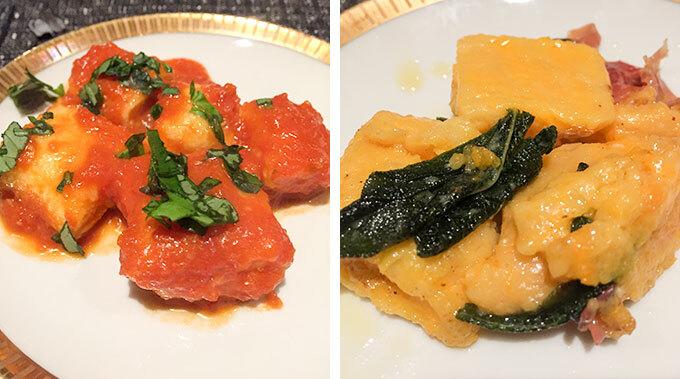 Each course had a unique hand-crafted pasta and delicious homemade sauce. All the time, effort, and joy that went into shaping each individual piece of pasta shined through, and made the dinner even more special. The final pasta, called “Caramelle,” was dessert: candy-shaped, stuffed with a puree of caramelized onions and figs, and sauced with a fondue of gorgonzola cream. 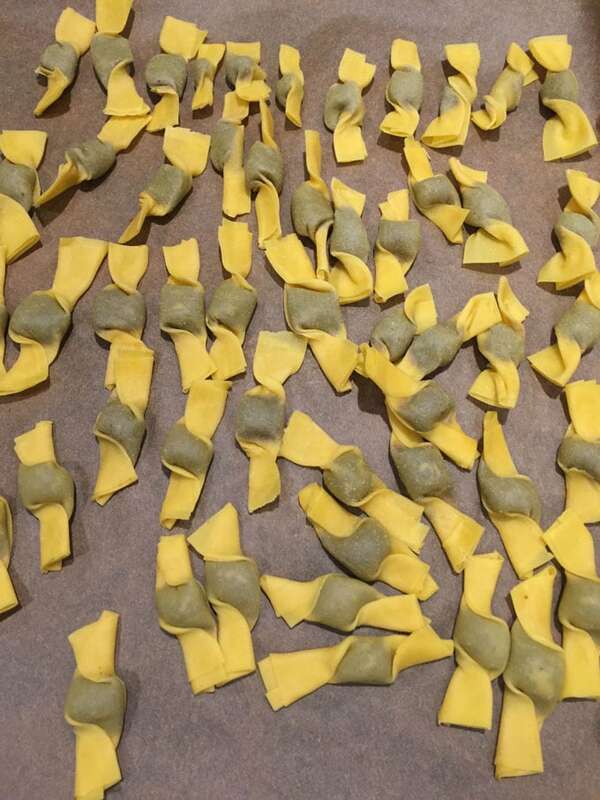 Here’s a video I posted on Panning The Globe’s Facebook page of my husband Eddie demonstrating how to to stuff and fold Caramelle pasta. I would love to give you every recipe of this dinner and maybe over time I will. 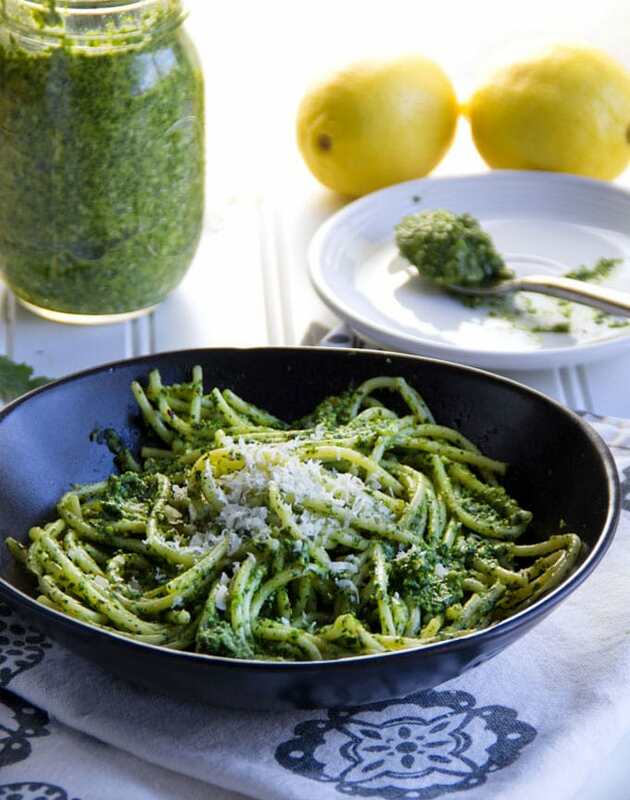 For now, I’m excited to share this extremely delicious, quick and easy arugula pesto recipe. Another thing I love about this pesto is that baby arugula is widely available year round. I buy it in plastic boxes at Whole Foods. This recipe uses 1 1/2 of those boxes. It’s pre washed and you don’t even have to remove the stems. Just grind it up in your food processor with cheese, garlic, pistachios, lemon, olive oil salt and pepper. Toss it with your favorite pasta and enjoy! 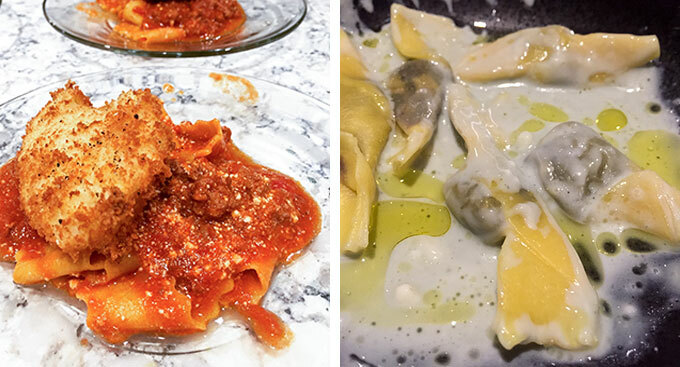 Here’s the link to my Turkey Ragu recipe, that we served over the pappardelle pasta, with the fried poached egg on top. My son Brian made the fried poached eggs. Here’s his recipe: first he poached all 12 eggs, making sure to keep the yolks runny. Then he set up a classic breading station like the one pictured in this post for Chicken Schnitzel. Fist he dipped the poached eggs in seasoned flour to coat them, then he dunked them in a bowl of whisked eggs, then he rolled them in Panko bread crumbs to coat. Then he fried them in a skillet, in about an inch of canola oil. 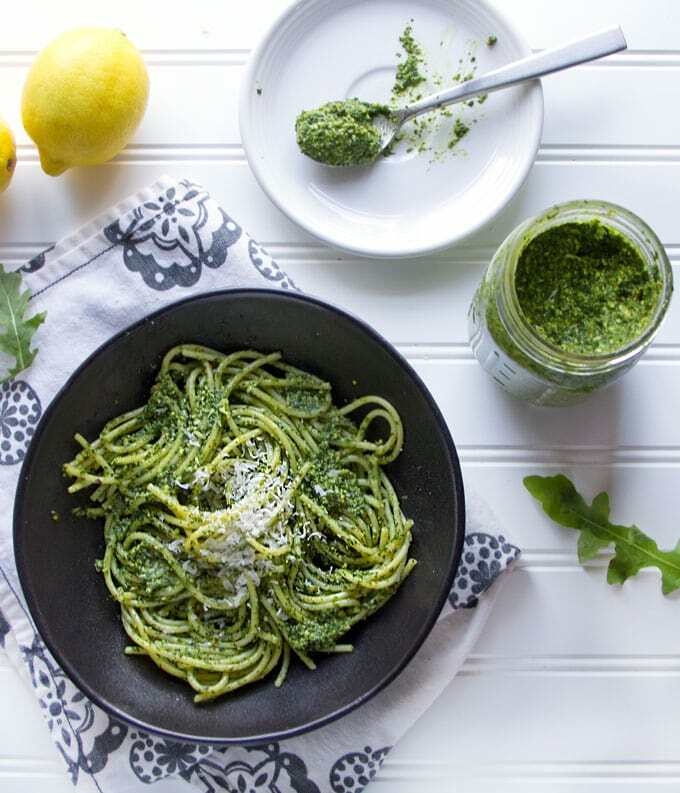 Here’s the recipe for pistachio arugula pesto with pistachios and lemon. I hope you enjoy! If you make this I hope you’ll come back and let me know how it turned out. Delcious, flavor-packed pesto sauce. Perfect over delicate homemade pasta or a fine store-bought pasta such as angel hair or capellini. This makes enough pesto for 1 pound of pasta. I recommend serving this with homemade trofie pasta or store-bought capellini or angel hair. Put the garlic, toasted pistachios and salt in the bowl of your food processor, fitted with the steel chopping blade. Pulse for 10 seconds or so to a fine chop. Add one third of the arugula and pulse to a rough paste. Repeat twice more with remaining arugula, until everything is combined into a paste. Add the lemon juice and pulse for a few seconds, to combine. With the motor running, drizzle in the olive oil to emulsify the sauce. Scrape the pesto into a bowl and stir in the parmesan cheese. Cover and chill up to three days. When ready to use, put the pesto into a large skillet or heavy pot, large enough to hold the pasta. Cook the pasta in salted water. Reserve 1 cup of the starchy cooking water before draining the pasta. Add the pasta to the pot with the pesto and toss over medium-low heat, adding pasta cooking water, a tablespoon at a time, until you get your desired consistency. Season with salt, to taste. Serve hot. Pass around extra parmesan cheese. The grocery store near me sells basil like it’s saffron. Working on the herb garden now but glad to have a pesto recipe in the arsenal that’s this good without having to buy basil. What a fun and delicious project!